We need to convert sensor raw counts to engineering units in a PLC system. We have a sensor which gives a raw value input of the range 4000 to 20000. We need the sensor value in a output scaled range of 0 to 1450. Find a formula that will allow to calculate the scaled value from the raw one. I’ll make up an example: I get a raw reading of 12456 from the sensor. How do we convert that to a scaled output value? We have an elevated Zero (4000 = 0 Units) so you need to subtract that from the 12456 to start with. The span of your sensor 0 to 1450 units = 16000 (20000 – 4000). Once the zero is taken care of it’s a simple percentage or ratio calculation. another way to visualize it. To go from units to the raw value would be the same except you’d need to add the zero (4000) to the ratio. What would raw value of 725 units be? 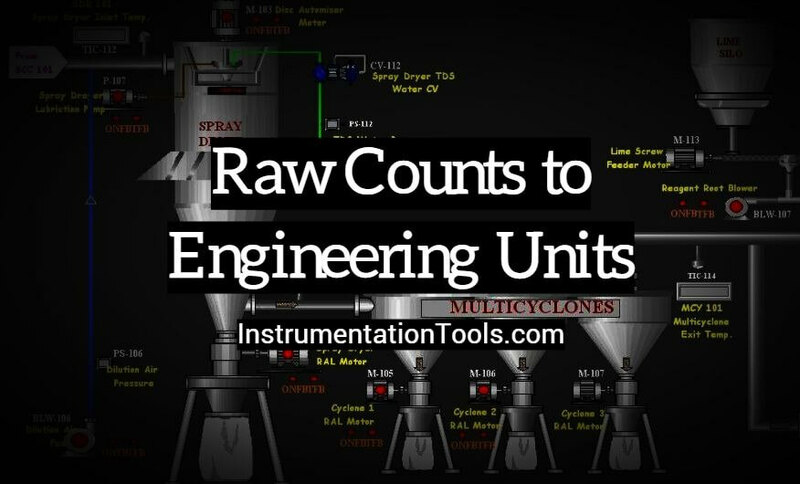 Hopefully now you can solve your raw counts calculations using the above formula. Spare some time to evaluate your skills on the raw count calculations. Using the above example, find-out scaled output for the following raw counts : 15750, 35780, 6854, 24758. You can share the answers using below comments section. Do you have any other similar formula for the conversion ? Share with us. Why 4-20mA Standard is so popular ? How a PLC do the Scaling for a Sensor ? Here is a typical example where a pressure sensor is used to measure 0-500 PSI and the output is 1-5Vdc. First, using the Y=MX+B formula, we determine what each value is in order to calculate for Y. B = -125 ( since the output starts at 1 volt, there is an offset. We calculated a value of 125 PSI/Volt, therefore, 1V = -125) If the output of the sensor was 0-5Vdc, then there would be no offset. To test that the values are correct, put them in the equation. 5 volts out should give us 500PSI and 1 volt out should give us 0 PSI.